The Dalai Lama, November 2009:"Global issues should be number one," "In some cases, in order to protect global issues some sacrifice for national interest is worth it in the long run. Global warming, these things, they suffer everybody." Al Gore, December 2008: "We can’t negotiate the facts. We can’t negotiate the truth about the situation. And for those who are too fearful to finish, it can be done and must be done. Make sure we succeed, . . . It is wrong for this generation to destroy the habitability of our planet and ruin the prospects of every future generation." Dr Jay Zwally, December 2007: "The Arctic is often cited as the canary in the coal mine for climate warming… and now as a sign of climate change, the canary has died." Source: Seth Borenstein, ‘Arctic sea ice gone in summer within five years?’, Associated Press, 12 December 2007. 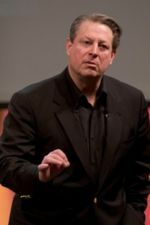 Al Gore, July 17, 2008: "Today I challenge our nation to commit to producing 100 percent of our electricity from renewable energy and truly clean carbon-free sources within 10 years.". Barack Obama, July 2008: "I strongly agree with Vice President Gore that we cannot drill our way to energy independence, but must fast-track investments in renewable sources of energy like solar power, wind power and advanced biofuels." Barack Obama: "The issue of climate change is one that we ignore at our own peril. There may still be disputes about exactly how much we're contributing to the warming of the earth's atmosphere and how much is naturally occurring, but what we can be scientifically certain of is that our continued use of fossil fuels is pushing us to a point of no return. And unless we free ourselves from a dependence on these fossil fuels and chart a new course on energy in this country, we are condemning future generations to global catastrophe." Bill Clinton, "First, I worry about climate change. It's the only thing that I believe has the power to fundamentally end the march of civilization as we know it, and make a lot of the other efforts that we're making irrelevant and impossible." Prince Charles: "The world’s forests need to be seen for what they are.. giant global utilities, providing essential services to humanity on a vast scale. Rainforests store carbon, which is lost to the atmosphere when they burn, increasing global warming. The life they support cleans the atmosphere of pollutants and feeds it with moisture. They help regulate our climate and sustain the lives of some of the poorest people on this Earth." Rupert Murdoch: "Climate change poses clear, catastrophic threats. We may not agree on the extent, but we certainly can't afford the risk of inaction." Professor David Karoly: "We are in an extremely precarious and urgent situation that compels immediate action"
Sir Nicholas Stern: "There is still time to avoid the worst impacts of climate change, if we take strong action now." Ban Ki-moon: "For my generation, coming of age at the height of the Cold War, fear of nuclear winter seemed the leading existential threat on the horizon. But the danger posed by war to all humanity—and to our planet—is at least matched by climate change." Ban Ki-Moon: "Given the nature and magnitude of the challenge, national action alone is insufficient. No nation can address this challenge on its own. No region can insulate itself from these climate changes. That is why we need to confront climate change within a global framework, one that guarantees the highest level of international cooperation." Martin Luther King, Jr: We are now faced with the fact that tomorrow is today. We are confronted with the fierce urgency of now. In this unfolding conundrum of life and history there is such a thing as being too late… We may cry out desperately for time to pause in her passage, but time is deaf to every plea and rushes on. Over the bleached bones and jumbled residue of numerous civilizations are written the pathetic words: "Too late." George Washington: Government is not reason, it is not eloquence, it is force; like fire, a troublesome servant and a fearful master. Never for a moment should it be left to irresponsible action. Governor of Victoria, Professor David de Kretser: There is no doubt in my mind that this is the greatest problem confronting mankind at this time and that it has reached the level of a state of emergency. Climate Code Red book launch, 17 July 2008. This page was last modified 05:38, 12 June 2011. This page has been accessed 72,414 times.